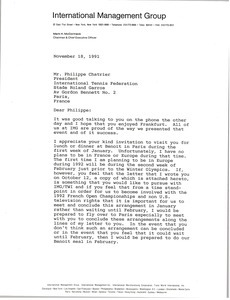 McCormack writes regarding pursuing something with International Management Group, Trans World International and the 1992 French Open Championship. He sends a letter he wrote to Chatrier in October and an article from the September 1991 edition of the Australian Golf Digest regarding Jim Barr. Enclosure not scanned. 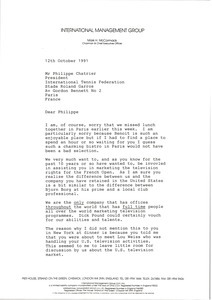 McCormack writes regarding marketing the television rights for the French Open and television rights in the international marketplace. 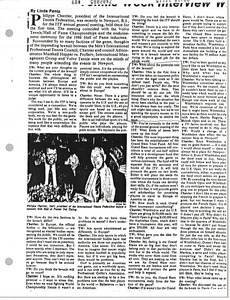 He sends an article from the September 1991 Australian Golf Digest regarding Australian Golf Union President Jim Barr. Enclosure not scanned.